The plant in your picture is called Common Toadflax (Linaria vulgaris), also known as 'Butter and Eggs' or 'Wild Snapdragon'. Common Toadflax is a member of the Foxglove family and was brought to North America almost 200 years ago as an ornamental plant. Over the years, it has been used medicinally for digestive and urinary tract disorders and as a diuretic, among other things. It is a delicate, pretty perennial wildflower that has an extensive horizontal root system that most often forms colonies. It reproduces both through creeping roots (called rhizomes) and by seed. One plant can be very prolific and produce up to 30,000 seeds per year! 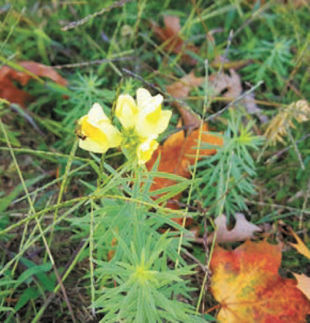 The flowers resemble snapdragon flowers and range in color from pale yellow to bright yellow with orange throats and bloom from June through August. As you can see in your picture, the flowers grow on stalks in dense clusters at the ends of the stems. The narrow, pointed leaves are often pale green or grey-green in color and are alternately arranged on the stem. Bumblebees, some butterflies and moths are good pollinators of Toadflax because they are strong enough to get their long tongues deep inside the throats of flowers to get to the nectar. If you like the Toadflax, I'd say to let it be and allow it to grow. You will be helping to feed the bees, butterflies and moths. It will also save you work weeding your garden by forming a thick colony of plants that will out-compete the weeds. If you decide to remove the plants, it will be a fair amount of work because you will have to carefully dig it out by the roots.